There have been books and movies written about black women and their relationship with men, with other black women, and with their families. And now, their relationship with their hair. 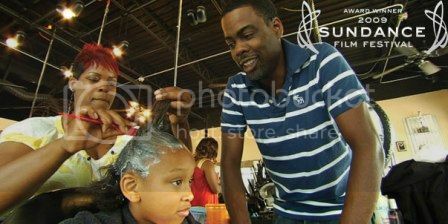 Good Hair, a documentary exploring hair culture in the African American community, is produced by actor and comedian Chris Rock, who came up with the concept for the film after his daughter Lola asked him, "Daddy, how come I don't have good hair?" Rock set out to find answers to his little girl's question. On September 24th, an advance screening of Good Hair was held in Washington, D.C. during the Congressional Black Caucus Foundation's legislative weekend, sponsored by the Root.com. The film successfully entertains and informs at the same time. Featuring cameos by some of Hollywood's top black actresses including Raven Symone and Nia Long, they share their experiences with "creamy crack" (aka hair relaxers), their hair weaves, and what they will and will not do to protect their hair (including, ahem, during intimate moments). The most hilarious and insightful cameos come from Rev. Al Sharpton (known for his relaxed and curled hair), poet Maya Angelou and rapper/actor Ice-T. The film goes behind the scenes of the Bonner Brothers international hair show (and if you're a Real Housewives of Atlanta fan, you'll recognize someone) and the hair weave industry. And Chris Rock? He helps to whip up a batch of perm, make hair weave in India, and even conducts scientific research on hair relaxers. Who knew an ingredient found in relaxer can disintegrate a soda can? So what is the answer to Lola's question? The film exposes many more issues in black hair culture and in the black hair industry, which is a billion dollar industry, but is not run by or rarely benefits black people. The film opens nationwide on October 9. I am going to see the screening tonight in New York! Thank you for the heads up. I think this doc was a great idea, and more need to be made just like it. I can't wait til our race finally wakes up and realizes the way God made us was perfect. Thanks for your insightful comment-you'll love the film! Thanks for the link to your film! So 70% of all hair weaves, wigs and extensions are purchased by black women? Wow.